Christmas is just one month away, so over the past few weeks brands and companies have been unveiling their festive campaigns. This year- as is often the case- a fair proportion of them have been animated. 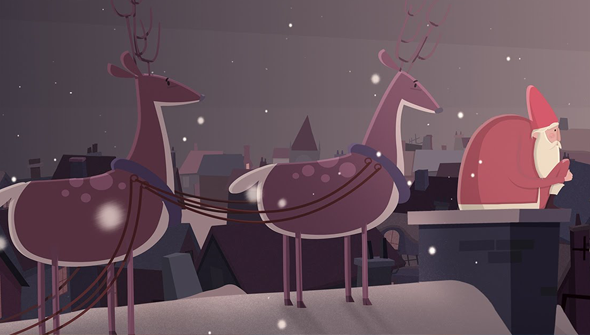 In contrast to all these celebrations of Christmas consumerism though is Santa Forgot, a beautifully animated piece for UK charity Alzheimer's Research. The two minute short- produced by Aardman Animation- features a young girl named Freya who learns that Santa stopped delivering presents after his memory began to fail. She decides to try and help him. This is a very serious subject, and it's easy to see how this could have felt crass, but luckily that couldn't be further from the truth. It's gorgeously animated and wonderfully narrated by Stephen Fry. Most of all though, it's hugely moving. It has created angry reactions from some members of the public who feel like it is spoiling the magic of Christmas somehow, but they are missing the point. Their assumption seems to be that the campaign is aimed at children- but the actual point of the advert is to raise awareness and funds for the charity, meaning that it's aimed squarely at adults. Notably, it is only being screened on TV after the 9pm Watershed, over concerns that children will find it upsetting. But they won't be the only ones. We warn that it's quite a tough watch- especially if you've been personally affected by seeing loved ones afflicted with this horrible disease. Readers in the UK can donate £5 to the campaign by texting BELIEVE to 70755 today.